Anyone here swap out their lug bolts for studs? 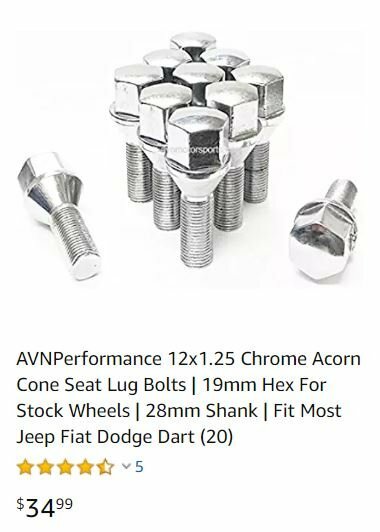 Seems like you would have a lot better options with lug nuts and it would be easier/faster to change tires. Would these work? You think safety is compromised? Did they come in yet? I am sure they work, it would be safter to make sure they are torqued in properly and I would use some type of thread lock to be on the safe side, knowing that the wheel bearings would need replaced if there were damage to the studs or if you wanted to switch back. I would stick with lug bolts, especially if you are sticking with the stock wheels, but that's me. Agree entirely, as someone who has been removing and replacing wheels with European style bolts instead of studs and nuts for several decades without problem, there is nothing wrong with the bolt system. The wheel can be hung and rotated to index the holes to the hub holes with no problem. [QUOTE=Black Knight;640876]Did they come in yet? As I mentioned in an earlier post, they do not ship to Canada. I had to order them to my US address in Lewiston NY. They arrived there and were picked up by my brother who lives close to the border. So, although they are now in Canada, I won't get them until I go down to visit him later this year.